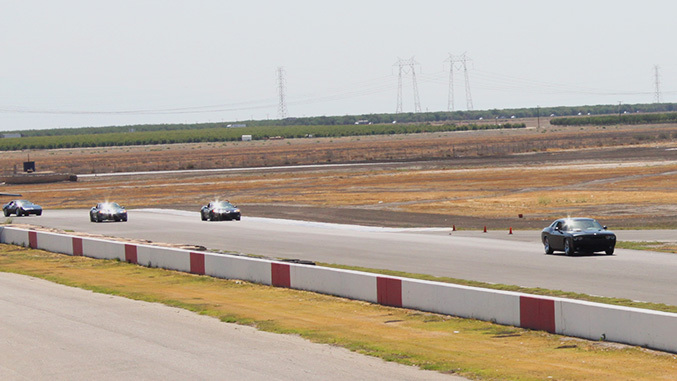 Time Trials are designed to offer a venue for drivers who’ve had some track experience to move beyond track days and into a more competitive environment for road course driving. Time Trials is a four-tiered program that starts right where track days leave off – with essentially stock street cars – all the way to Track Trials, which require race-prepped cars for Club or Solo events to be used, and Hill Climb events (think along the lines of a miniature Pikes Peak), with the common thread among all of these tiers being that you’re racing against (or working toward racing against) the clock on a closed course. What Kind Of Gear, Training and Licensing Do I Need To Participate? For those entering the Time Trials program at Tier 1, also known as PDX, the gear requirements are more or less identical to track days – a mechanically sound vehicle and an SCCA-approved helmet. Tier 1 is a non-competitive program which focuses on instruction, helping drivers improve their skills (and lap times) by putting them on courses which feature a wide array of different handling situations and providing feedback on technique. Accordingly, this is a street car focused tier, so modifications to your vehicle are not required, and race-prepped cars are normally not included in the PDX tier. Tier 2, or Club Trials, is the first tier of competitive time trials in which drivers and cars are divided into classes and timed, but the gear requirements are the same as PDX. The third tier, Track Trials, is where things begin to look more like club racing events. Driver’s required gear is similar to that of Club Racing – an approved fire suit, gloves, fire-resistant socks, and an SCCA-approved helmet. A full list of the rules for Track Trials (and Hill Climb) can be found here. 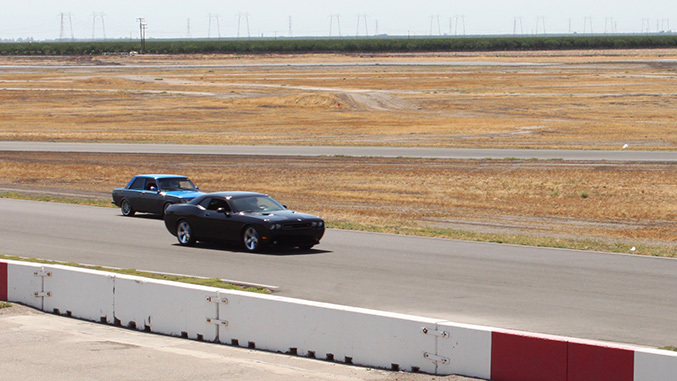 Similar again to Track Night events, PDX and Club Trials do not require an SCCA competition license, though those new to the program will need to fill out the Time Trial/Novice Time Trial Application and get a temporary SCCA membership. 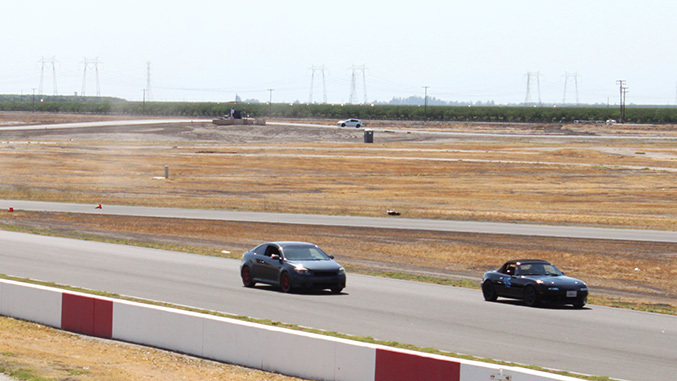 Track Trials require SCCA memberships and Time Trials competition licenses or Novice Permits, while Hill Climb licensing requirements vary depending on the event, and will be identical to either the Club Trials or Track Trials as determined by event officials. What Do I Need To Do To My Car To Prepare It For Time Trials? In PDX and Club Trials street cars are used, and how you modify the car (provided it remains street legal) is entirely up to you. In our autocross segment of The Guide we used the same vehicle that we're using for Time Trails – a 2009 Dodge Challenger – and while it performed competently on the autocross course (once we got the Pilot Super Sports on, anyway), we still noted substantial brake dive and the somewhat leisurely weight transfer that’s common with cars of this size. We realized that the road course would only exaggerate these behaviors, and decided to swap out the OEM springs and Bilstein dampers for a set of KW Clubsport coilovers. 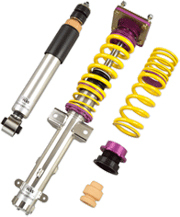 These particular coilovers not only stiffen up the suspension and allow us to bring the car’s center of gravity down to taste, they also feature independently adjustable rebound and compression settings, allowing drivers to tailor suspension behavior according to the vehicle load, tire characteristics and the varying conditions of different courses, which in turn provides more stability, better road holding, and potentially faster lap times. 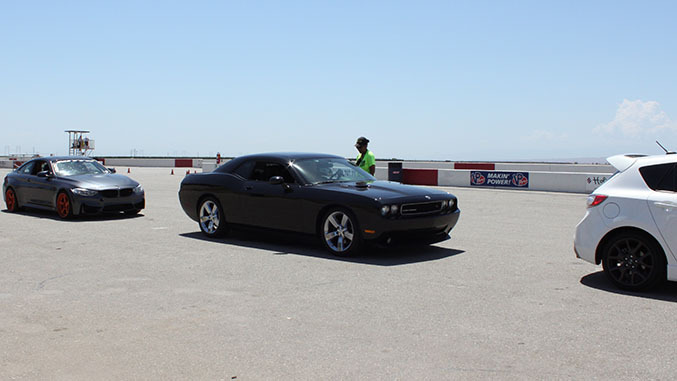 In the Challenger the swap’s benefits were immediately noticeable, both on the road course and on the street. In the recommended settings, compliance does take an expected hit over the stock springs and dampers (which are not designed for intensive track use), but with the system’s adjustability it’s reassuring to know that if we want to dial back the aggressiveness for street use, the ability to do so merely requires a few clicks of each corner’s adjuster. From a performance standpoint, the swap worked exactly as intended. The Clubsports significantly curtailed brake dive and body lean while also substantially improving stability over both mid-corner and high speed bumps as well. 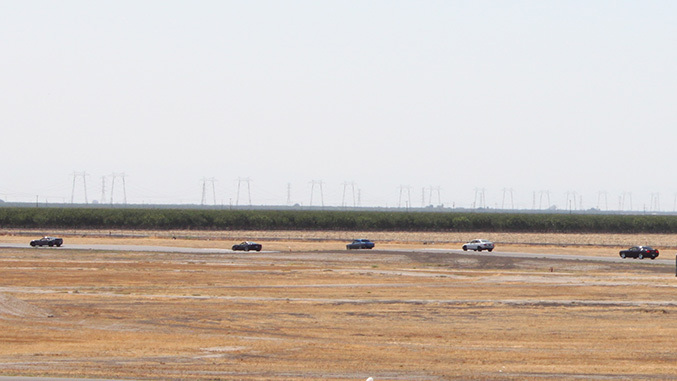 We unfortunately did not get a chance to test lap times back to back between the stock setup and those with the Clubsports due to scheduling constraints, but from the driver’s seat, just the increase in confidence and improved feedback from the car undoubtedly took large chunks of time off of our laps at Buttonwillow Raceway Park. That said, how you choose to modify your car for the first two tiers of Time Trial duty is entirely up to you, if you choose to modify it at all. However, two areas you should pay particular attention to are cooling and, perhaps most importantly, the braking system. Most street cars aren’t equipped out of the showroom to be ran at full wick on a road course for half an hour at a time, so it’s wise to ensure your car is up to the task. In some cases that might simply be a matter of swapping in race-spec brake pads to avoid diminishing returns in braking performance as the session progresses, for other high performance vehicles you may be ready to hit the road course without anything other than safety checks. Much like the driver’s safety equipment requirements when competitors move up to the Track Trials and Hill Climb tiers, the vehicle requirements in the upper levels of TT begin to look more like those of club racing. This includes driver restraints, a roll bar or cage, fire extinguisher, a window net, and so on. Vehicles must meet the safety requirements for the class they’re assigned to. A full rundown of the Tier 3/4 vehicle requirements can be found on the third page of the Time Trials rulebook. 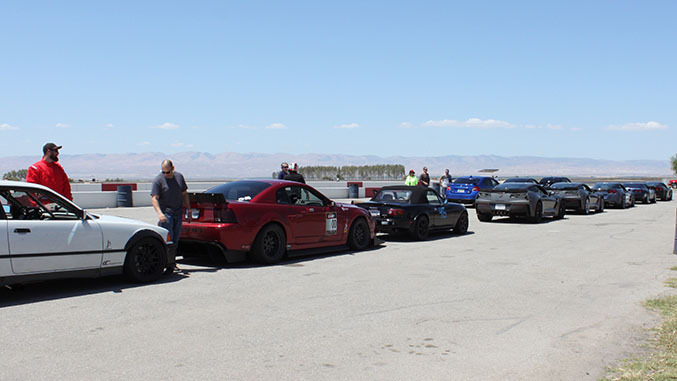 For those who have not participated in SCCA events previously, a temporary SCCA membership is required. Temporary membership typically costs from $15 to $25 – the actual figure is determined by the SCCA region – and is valid for six months. New Time Trials participants will also need to fill out the Time Trial/Novice Time Trial Application to get their Time Trial Permit, which carries a fee of $35. Lastly, the events themselves vary in cost anywhere from about $125 to $250 per day depending on location, with Time Trials events typically being held over a two-day race weekend (with the option of participating in one or both days) in conjunction with club racing event. What Is The Sequence Of Events At Time Trials? Since the scope of Time Trials runs across four different tiers, and many of the TT events are held alongside club racing events, the exact sequence of how the TT sessions are conducted will vary depending on that criteria. 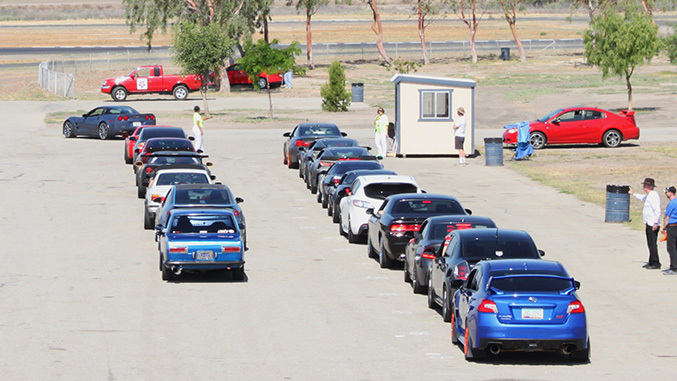 Our TT event was held at Buttonwillow Raceway Park in Buttonwillow, California, along with a Cal Club racing event. Once arriving on track, drivers are required to bring their vehicle and, in the case of PDX and Club Trials events like ours, a helmet to be signed off by Tech as eligible to run. Before heading out for the first session, which includes two initial lead-follow laps for course familiarization, the Time Trials program steward holds a driver’s meeting to make sure everyone is on the same page in terms of understanding the flags and where the passing zones are, and to go over other logistical and safety issues, such as point-by passing rules and features of the track to be aware of before heading out. For our event the Time Trials participants were treated as a single run group, and the TT run group’s 20-minute sessions would be conducted between the sessions for the other three run groups of club racing classes. Our event provided four separate TT sessions throughout the day, with approximately an hour and a half separating the first three sessions, and last TT session being held after both lunch and the other run groups’ sessions were concluded, equating to a longer gap between the third and fourth session, which provided drivers some extra time to make vehicle adjustments if necessary. While Time Trials is a great entry point into competitive track driving, it’s also a useful discipline for both track day drivers who’re not necessarily looking to move on to wheel to wheel racing, but want less restriction in terms of pace and more time on-track over the span of a particular day than they might get on a track day – and one that’s staffed by SCCA officials rather than a private track day organization, which often has its own inherent benefits in terms of both safety and knowledgably. Additionally, club racers who’re testing setups can also find TT events useful – we saw a number of cars from various club classes running in our session, presumably capitalizing on the extra track time to dial in the car, with the emphasis on lap times helping to provide insight on which adjustments are working and which are not. Similar to our experience with autocross, the level of formality between TT events can vary widely depending on who (in terms of regions) is conducting them and, specifically in the case of Time Trials, which tiers of experience the events are catering to the most. For our particular event, the focus was mainly on PDX and Club Trials-level driving, and although there were race prepped cars running in our group, vehicles were not divided into competitive classes and timed against clock, and drivers were required to provide their own method of timing or rent a transponder if they chose to do so to keep track of their progress, as officials were not conducting this particular TT event as a competitive event. We’d presume these characteristics are variable depending on the region and each specific event, but if you’re looking for a particular type of experience from Time Trials, it’s worth studying the information for the event on the signup page to ensure that your expectations and the event jive with one another. But if nothing else, if you want a chance to run your street car with as much pace as you can muster out of it and your own ability (getting caught in traffic notwithstanding), TT events like this one will deliver on that level with very little fuss, regardless of any other external factors.